The city of Turin looked to the sky yesterday to see the new heights achieved by Lamborghini. 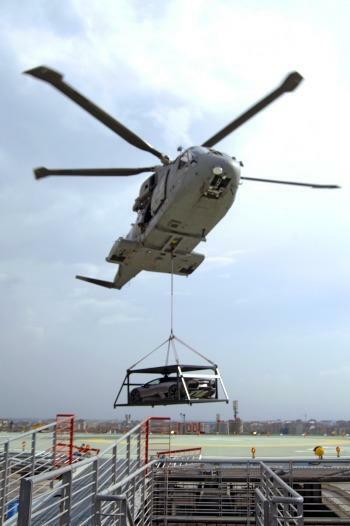 The Lamborghini Reventón was carried by military helicopter over the automotive 'hub' of Italy, thanks to the special co-operation of the Marina Militare Italiana (the Italian marines). It landed on the rooftop of the Lingotto building and closed a conference hosted by Lamborghini, entitled ”Lamborghini and speed – a project in record time”. The conference explored the extraordinary timescales and design and production abilities demonstrated by Lamborghini in producing its €1 million euro super car, of which all 20 units have already been sold. The conference was attended by local, international and academic delegates including representatives from the automotive industry. Lamborghini’s conference was part of the “Turin 2008 – World Design Capital” programme of events.